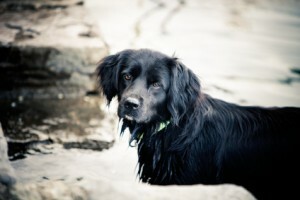 Sly is a black Labrador Retriever and Border Collie mix looking for a new home. He was found by his owners’ landlord after they skipped out of their condo without a word. Sly wasn’t alone–two dogs were left behind, and both struggled to fend for themselves in the abandoned rental property. While it is always frustrating when a tenant skips out, especially when they leave behind a mess, nothing is more heartbreaking than discovering an abandoned pet. Sly is described by his adoption agency as “generally a quiet dog” and “a decent all around soul” but not all abandoned critters are as resilient. Landlords who encounter an abandoned pet must exercise caution. Don’t try to make friends, or walk through the property where the animal has access. Call your local Animal Control Services or police and allow them to handle the situation. The tenant may have committed a crime by leaving behind a pet without adequate care. This makes it all the more important to involve law enforcement authorities so the tenant will be accountable for the crime. Having the support of the police also will corroborate that the animal was endangered in the event the tenant later complains that you entered the property. Make sure you have the legal right to enter the rental property. That occurs if you provide adequate notice, the situation is an emergency, or the property appears to be abandoned. While you must consult your local laws for guidance on how to determine whether the rental property has been abandoned, it is likely that if the tenant has stopped paying rent and has removed most possessions, the landlord can assume the property is abandoned; however, if you are not sure, check with your legal counsel before you take any action. Maintain records in case the tenant disputes your actions at a later date. Also, retain receipts for any costs you might encounter. Proper leasing procedures will reduce the risk that a tenant will abandon the rental property. Always require a completed rental application that includes emergency contact information and personal references. The information may make it easier to track down a tenant. Additionally, conducting a tenant background check and speaking with the previous landlord will expose tenants with a bad rental history–like Sly’s former owners.